Actor Kal Penn said he feels insulted as an American by the action and rhetoric President Trump has used in relation to the travel ban. "I think what the President is saying and doing is completely ridiculous" he told CNN's Chris Cuomo. "I find that insulting as an American citizen that you would infer that anybody who helped our soldiers stay alive are somehow bad dudes." "If the ban were announced with a one week notice, the "bad" would rush into our country during that week. A lot of bad "dudes" out there!" Trump signed an executive order Friday to keep refugees from entering the country for 120 days and immigrants from seven predominantly Muslim nations out for three months. The ban snared green card holders and people with valid visas alike, including Iraqi interpreters who had helped the U.S. Army. Penn was on CNN's New Day to talk about the more than half a million dollars he's raised for Syrian refugees over the weekend. 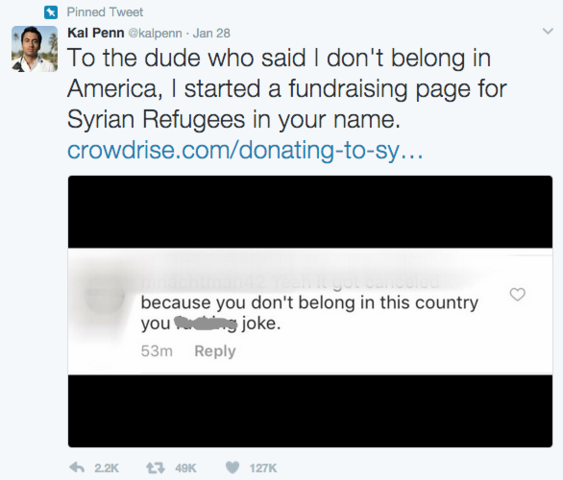 He set up a crowdfunding page for refugees in response to a hateful message he received on Instagram on Saturday telling him he didn't belong in America. "I'm a pretty privileged guy. What about the 14-year-old me or the kids who look like me who don't have the luxury of this platform?" he said. Kal said he hasn't heard from the person who sent him the initial message, choosing to focus on the positive instead. "I think I'm instead focusing on the 12,000 amazing people who brought the pot up to $500,000" he said. "There's so much power and beauty in turning something hateful into love. That's what we're surrounded with. It's amazing."